Fig.1 Ormonde Fields House was built on the site previously occupied by Hill Top Farm, which was owned for many years by the Woolley family. Fred S Thorpe records in his book “The Heritage of Codnor & Loscoe” that Mary Fletcher gives a building date of Hill top Farm as being 1668. He goes on to point out that this cannot be confirmed but a stone built into the Garden wall at Ormonde Fields house does give a date of 1716. William Shiptons Map of 1792 shows that land around the Ormonde fields house area was owned by Job Hart Price Clarke Esq. A female decendent of J.H.P. Clarke married Walter Butler who went on to become the Marquis Of Ormonde in 1815. The Marquis of Ormonde inherited the mining rights in Codnor & Loscoe through his marriage to the Clarke Decendent. After his death the estate was sold by auction in 1824, Hill Top Farm and much of the surrounding land was purchased by Samual Woolley with the mining rights going to the Butterley Company. It was Samual Woolley's son (also called Samual) who was living at Hill Top farm in 1866 when it caught fire. Joseph Millot Severn describes the event in his book “My Village” he records how a spark from one of the nearby pits, set fire to the thatched roof of the farmhouse and despite the desperate efforts of the villages to bucket water from the pond near Field Lane (Nottingham Road) up to the farm, the building was severely damaged. Fig.2 Above: The event was reported in the local newspaper. Later the thatched roof was rebuilt with slate and the Woolley’s continued to farm the estate until it was again sold by auction to Frederick Channer Corfield in 1889. Frederick Channer Corfield was responsible for building the Ormonde Fields House that we see today. He was born on 1st March 1849 in London, the son of Frederick and Sarah Weller Corfield. His early childhood was spent in Templecrone, Ireland, were he became interested in the Corfield family history and drew up his first family tree. On returning to England in 1866 he became employed by the Butterley Mining Company and also attended the Durham University were he studied Mining. During the 1880s, Frederick lived briefly at Waingroves Hall followed by Butterley Cox in Ripley. During this time he purchased Hilltop Farm from the trustees of Samual Woolley and began extensive renovation and extensions of the building. This was to become Ormonde Fields house. By 1889 Ormonde Fields House was complete and in December he moved in with his wife and their four children. Another four children were also born at Ormonde Fields. By this time Frederick was Manager of Butterley collieries and also Lieutenant commanding Butterley Detachment, 1st Volunteer Battalion, Derbyshire Regiment, (Sherwood Foresters). 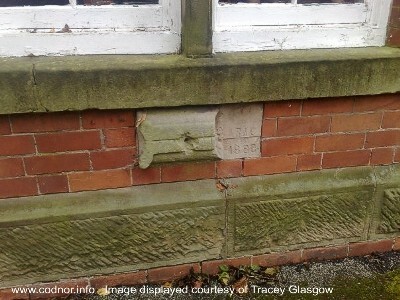 Fig.4 A stone built into the back of Ormonde Fields House has the inscription; F.C.C. and A.R.A.C. FEBY 1889. These are the initials of Frederick Channer Corfield and his wife Agnes Rebecca Augusta Corfield. There is also the remains of a religous motif, possibly originating from the chapel of St. Nicholas at Codnor Castle. By now Frederick was Manager of Butterley colliery and also Lieutenant commanding Butterley Detachment, 1st Volunteer Battalion, Derbyshire Regiment, (Sherwood Foresters). The following year in 1890 he is recorded as the founder of the Codnor, Loscoe & Waingroves Conservative Association. Frederick was a lover of rural country scenery and made considerable improvements to the surrounding area. The pit hills were flattened and hundreds of young trees planted. The incline that had been used to transport Ironstone from the Cupit Green pits, was reworked and made into a long drive with an avenue of trees. This is now known as Castle Drive. A culvert was made over the brook at the bottom of Goose lane and the black pit hills leveled over it. A gate was also installed at the top of Goose lane. A third entrance to Ormonde Fields House was from Nottingham Road (then called Field Lane) near the brook. This was called Foundation gate and led to the house via Langley Drive. Although he must be credited for all these vast improvements to the countryside he did upset a lot of people at the time. Many footpaths were closed and replaced by “Private Property, No Trespassing” signs. Frederick’s was very interested in the local history around Codnor, and would write articles for the Derbyshire Archaeological Journal. He also drew up an accurate pedigree of the Corfield family tree. His lifetime ambition was to acquire ownership of the Corfield ancestral home of Chatwall Hall in Shropshire. In 1899 the opportunity arose to purchase the Hall together with the surrounding estates from Joseph Edge and Edward Bagnall, the agreement for sale being dated 10th June 1899. Unfortunately Frederick became ill whilst on a business trip in London in 1904. He returned to Ormonde Fields House were he was attended to by Doctor Eames. His condition deterriated and the assistance of Doctor Ransom of Nottingham was called for, but it was to no avail and Frederick passed away on 4th December 1904 at the age of 55. A memorial service was held at Crosshill church and was attended by a substantial number of people. His body was then taken by train to Cardington in Shropshire were he was buried in the family vault of the parish church near Chatwall Hall. His wife Agnes wore black in mourning for her late husband until the day she died in 1941. His eldest son sold Ormonde Fields House to the Butterley company and the family moved to Chatwall Hall. 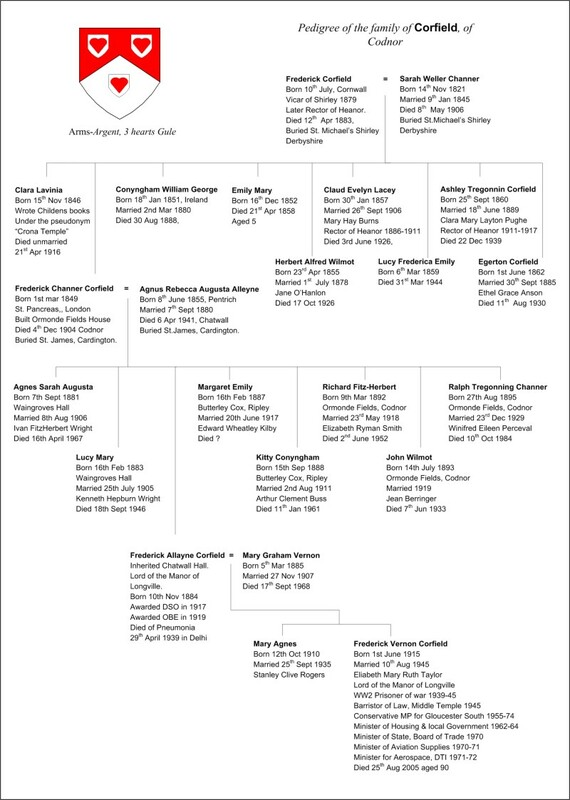 The next resident of Ormonde Fields House was Henry Eustace Mitton and his wife Augusta, the daughter of Henry Montague Bazeley of Belvior, Bideford. 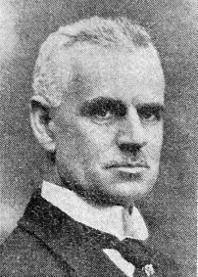 Henry Eustace Mitton M.Inst.C.E., F.S.I. Henry was born on 5th September 1872 in Bishop Auckland, County Durham. The son of Rev. Henry Arthur Mitton. In 1891 at the age of 19 he was involved in the “Klondike Gold Rush” and was the youngest white man to penetrate as far as “Forty Mile Creek” in the Yukon. He lived in British Columbia until he returned to England in 1894 and entered the Mining Profession. He served his apprenticeship with the Sheepbridge Coal & Iron Co. and at the end of three years was appointed assistant manager of the company’s Langwith Colliery. He then went on to be appointed General Manager of the Tredegar Coal & Iron Co in South Wales in 1900. He joined the Butterley Company as a Mining Agent in 1905 and became Mineral Referee for all of England in 1912-13. Henry was well known for looking after the interests of the working class people in the area. During the 1909-10 Railway strike, Henry was “angrily reproved” by the Midland Railway when he personally drove one of the Butterley Company’s railway engines during the stoppage down to St Mary’s Gate sidings, so that “the poorer citizens of Derby might have coal”. He went on to become a Director of the Butterley Company in 1927. 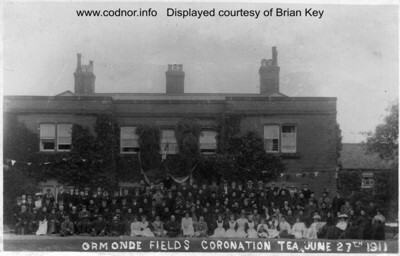 Fig.5 Ormonde Fields House showing the Coronation Tea for King George V in June 27th 1911. 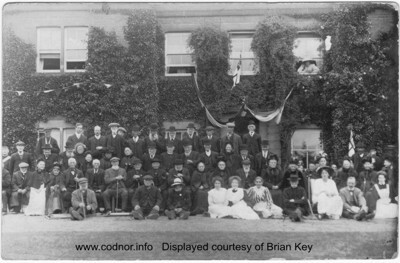 Fig.6 Another photograph at the same Coronation Tea Party, but of a smaller group. Henry Eustace Mitton is sat at the front, second from the right, his wife; Augusta is in the deck chair to his right. Henry’s wife planted the oak tree in Codnor market place in 1910 to celebrate the accession to the throne of George V.
Henry wrote many books, a lot of them being technical publications about the mining Industry, but he also wrote two books about his years in the Yukon. Klondyke: How to get there, when to go, and what to take. Henry campaigned tirelessly to improve working conditions for miners. One such example was to introduce Pit-head baths for the miners but surprisingly this was met with strong opposition from miners wives, their view being that they alone were responsible for looking after their husbands and sons and they strongly resented what they regarded as unwarrantable interference by outsiders. He introduced the Rheolavour system of coal washing to this country and later became President of the Institution of Mining Engineers 1929-1931. 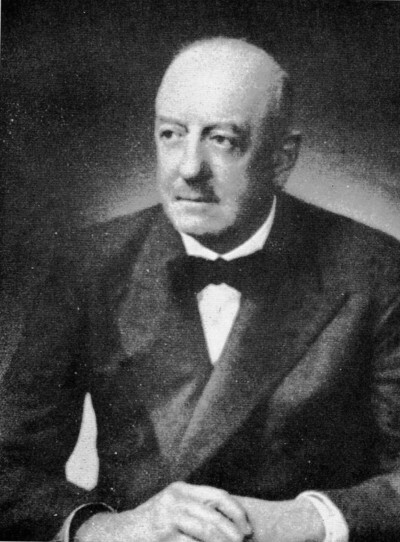 Later in 1934 he was awarded the Gold medal of “The Institution” for special work in relation to the advancement of lighting in and around mines. In 1926 a nine hole golf course designed by Fred W Hawtree was established on the Ormonde estate. A project championed by Mr Mitton, who had also been involved in the creation of the sports grounds at Codnor Miners Welfare three years earlier. Henry Eustace Mitton left Ormonde Fields House in May 1935 and went to live at The Mantles in Blithe near Doncaster, he died on 7th September 1946. 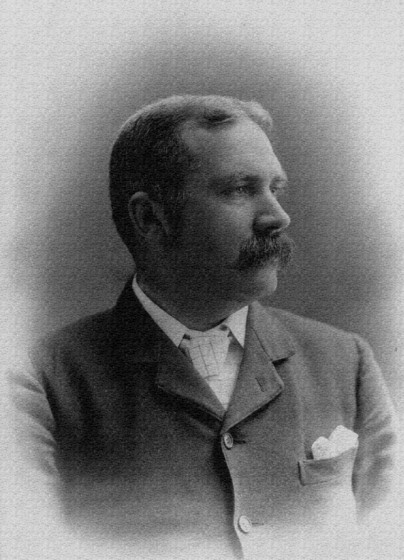 After Eustace Mitton left, Ormonde Fields House was occupied by Mr Joseph Bircumshaw, who had worked for the Butterley company since 1906. Joseph Bircumshaw had been the Mining agent for the Butterley Company for 22 years before he took over the responsibilities of Mr Mitton. Joseph and his wife Anne previously lived at Chatwell House, Kirkby in Ashfield before moving to Ormonde Fields House. He was born in Heanor in 1875 and commenced his mining career at the Shipley Collieries, subsequently going to the Denby Iron & Coal Company’s Salterwood and Ryefield Collieries. He came to the Butterley Co. Ltd in 1906, commencing at their Kirkby Colliery and after a short time was appointed manager of the company’s Portland and Birchwood Collieries. On 1st July 1912, Mr Bircumshaw was appointed mining agent for Kirkby, Lowmoor, Portland, and Birchwood Collieries, subsequently taking over the remainder of the company’s collieries at Ollerton and elsewhere. Joseph was largely responsible for the formation of the Butterley Company’s Ambulance Corps, which was considered to be the finest organisation of its kind in the midlands. After Joseph Bircumshaw, Ormonde Fields House was occupied by the Honeywill family. Mr Leslie Ross Honeywill of Ormonde Fields House was another Director for the Butterley Company and he had a family of six sons. 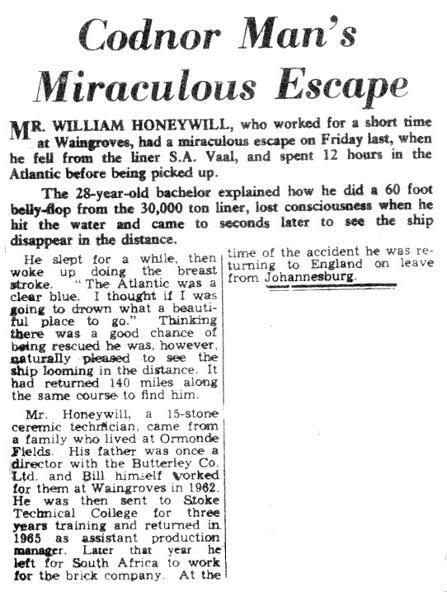 One of the sons, William hit the headlines on Friday 4th September 1970 when he fell overboard from an ocean liner in the Atlantic. During the early 1960s much of Ormonde Fields estate was opencast for coal, once this was complete and returned to farm land it was sold by The Butterley Company to Mr Bernard Swain around 1967. Mr Swain was responsible for increasing the Ormonde Fields golf course from 9 to 18 holes. 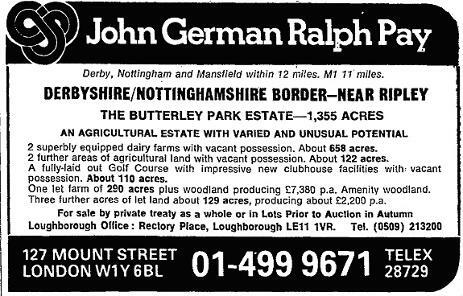 After several years of occupation the estate was once again put up for auction in 1978. 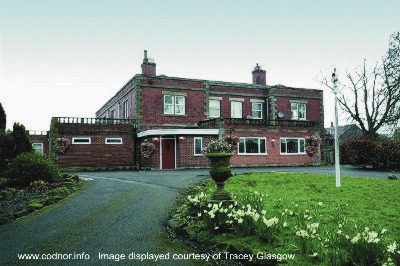 Ormonde Fields House and golf course were purchased by Derek Fearn in April 1979. His son John now runs the 18 hole golf course.